An image on the front cover of I.D. Magazine first drew me toward this weekend vacation home by 2008 National Design Award Winner Tom Kundig, with the unlikely name of Chicken Point Cabin. The interconnection of domestic and natural space was especially alluring to me. A native of the Pacific Northwest, Mr. Kundig comes from a craft-based design culture with roots in the area’s industrial and timber heritage. As an accomplished alpine climber, he is familiar with the rugged outdoors of tall trees, rocks, lakes, and big sky, along with the ropes and other equipment for mountaineering, all of which have influenced his architectural practice. The primary request of the family who commissioned the Chicken Point Cabin was that the architecture actively engage the wooded, lake-side site. This stipulation gave birth to the building’s main feature, a huge twenty by thirty-foot pivoting window, indicated in the drawing above by the two people standing in the open area. 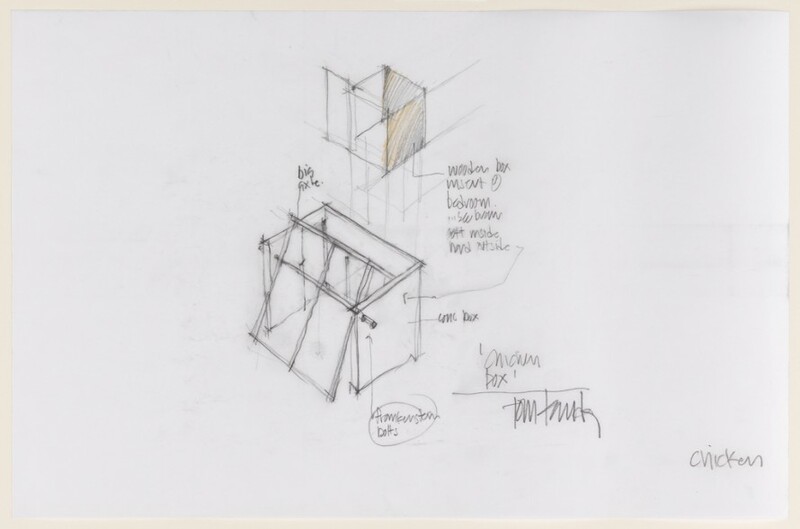 Drawing: Design for Chicken Point Cabin, Hayden Lake, Idaho:Box, 2000-03. Tom Kundig. Gift of Tom Kundig, 2010-10-4. 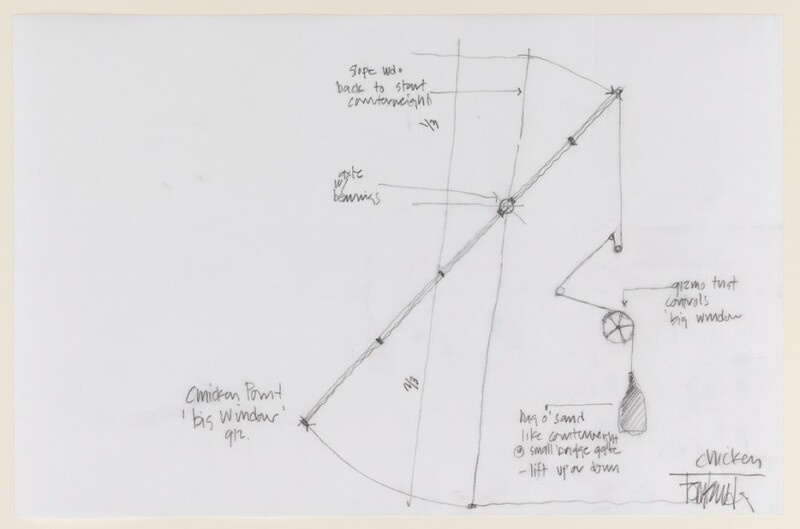 Working in collaboration with an engineering colleague, Kundig conceived of a hand-cranked “gizmo,” comprised of a set of gears, that requires a minimal amount of energy input to pivot the window open and closed. Even a child can do it, as you can see in the video’s on Olson Kundig Architect’s website. Drawing: Design for Chicken Point Cabin, Hayden Lake, Idaho:Big Window Gizmo, 2000-03. Tom Kundig. Gift of Tom Kundig, 2010-10-5. The almost cinematic act of pivoting the window and beholding the awe-inspiring view highlights the dramatic aspect of Kundig’s architecture. Chicken Point Cabin is a superb example of Kundig’s innovative domestic structures. It also exemplifies today’s fascination with hand-crafted, low-tech design that energizes a segment of the design and architecture community. Drawing: Design for Chicken Point Cabin, Hayden Lake, Idaho: West and South Elevations, February 15, 2001. Tom Kundig. Gift of Tom Kundig. 2010-10-1.